Today I found out about a shocking weather incident that happened in London not very long ago. In December of 1952, the city of London experienced a 5-day bout of “fog” that killed at least 4,000 people and made an estimated 100,000 sick. Fog? Isn’t that what London is known for? This was no ordinary fog. Dubbed “The Big Smoke” or “The Great Smog of ’52,” it was actually a severe air pollution event that was the result of a perfect storm of critical factors. Since it was wintertime and there had been a period of very cold weather, Londoners had been burning more coal than usual to stay warm. Add to this an anticyclone hanging above London (a dense high pressure system) plus almost totally stagnant, windless conditions- in effect, a layer of cold, stagnant air was trapped over London under a layer of warmer air above. The colder weather layer right over the city collected airborne pollutants from the coal and other smoke below. This formed a dense layer of fog and pollution over London that cocooned the city for nearly a week. On the surface, it seemed like a non-event. 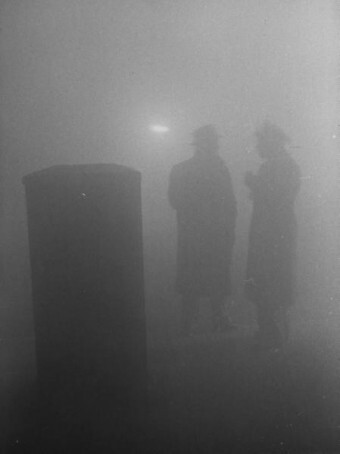 Londoners (sometimes called “pea soupers”) were certainly no strangers to fog. However, this was not your run of the mill fog. For one, it was far thicker than usual. It caused major visibility disruption, making it difficult to drive or even walk anywhere. It was reported to have penetrated into homes and was even visible in enclosed, indoor spaces. People began feeling short of breath and having other respiratory symptoms. Adding to the severity was the fact that, at this time, the coal that was being used was a cheap, low-grade variety that was especially sulphurous and noxious. This dramatically raised the amount of sulphur dioxide and other pollutants in the smoke. There were numerous coal-fired power stations in London at the time adding to the acrid pollution in the air. Diesel-powered vehicles also belched toxic exhaust into the air, and industrial and commercial sites expelled more toxins into the mix. During those five days, much of the public transportation system was halted, including ambulance services. The sick and injured were forced to transport themselves to the hospital. Since the smog could be seen even from just a few yards away, many indoor events had to be canceled. The fog/smog finally cleared up after about 5 days when the weather shifted abruptly and winds dispersed it. However, in the weeks that followed, government medical reports estimated that at least 4,000 people died prematurely as a direct result of particulates inhaled from the smog. 100,000 more were made sick due to the polluted fog’s effect on the lungs and respiratory system. Most of the people affected were either very young, elderly, or had pre-existing respiratory issues. More recent research paint an even grimmer picture of the event with some estimates having the number of “Big Smoke” fatalities as high as 12,000! Most of the deaths were caused by hypoxia which led to respiratory tract infections. There were also obstructions of air passages due to the pus that resulted from the lung infections. Lung infections were generally either bronchopneumonia or acute purulent bronchitis on top of a person’s previous chronic bronchitis condition. When the smog finally lifted, a blackish-gray layer of slimy soot was left on virtually all outdoor surfaces. The sooty grime remained until a few days later when the first rains after the fog finally came. The soot layer was rinsed off the city and into gutters and drains. A pungent smell filled the atmosphere in London which some described as being similar to acrid, wet soot, making the eyes and nostrils burn for those who ventured outdoors at this time. Not surprisingly, it is considered the worst air pollution incident in the history of Great Britain. It also had a profound impact on raising awareness of the connection between air quality and health. It influenced environmental research about air quality, weather, and pollution that was to follow in many countries, including the United States. It also had a significant effect on government air quality awareness practices and regulations that would be crafted in later years, including the Clean Air Act of 1956. This tragedy has fed the modern impetus to environmentalism. Air pollution began to be taken seriously, as the smog clearly demonstrated its lethal and tragic potential. New regulations were implemented and the use of dirty fuels in industry as well as black smoke emissions were banned. Coal fires in homes were also phased out and gave way to gas, oil, and electric heat. Even with all the changes, a decade later a similar event happened in London, though there weren’t nearly as many deaths associated with this latter event. However, during the smog of 1962, the highest levels of sulphur dioxide in the air over London were recorded. About the Author: Adam works with FPFilters—providing sustainable filtration solutions for industry. Adam writes to raise awareness and educate, as well as entertain about environmental industrial issues. Global warming – it’s the UK’s fault!! I remember the night of the smog. I was in the Royal Navy and went on a weekend pass from Littlehampton Sussex where i was stationed. We travelled by coach to Victoria coach station. I was living in Clapham South West London. On the Sunday when i was due back to catch my coach the smog came down. All buses and tramsstopped running. I walked back to the Coach station. Unable to see where i was going, made my way by going from one bus stop and looking at the bus numbers, Walking along the kerb as if i had walked on the far side of the pavement would have missed stop. Took me about 4 hours to get to Victoria. Only a few of us made it. we sat on the coach and waited for the fog to lift. On the monday coach was full and we made our way back to Sussex.